The Huichol are an indigenous Aztec group who have immigrated from Mexico and who maintain many of their pre-Columbian cultural and religious practices. Huichol are well known for their intricate artwork consisting of beads, and painted yarn, as well as their shamanistic practices and use of the hallucinogenic peyote. Huichol in Mexico have faced increasing pressure from mining interests invading their lands, as well as Westernization and urbanization. Many have left their traditional homelands in search of better economic opportunity for themselves and their families, and send a significant portion of their income to their families and communities in their hometowns in Mexico. The primary religion of the Huichol is a mixture of Roman Catholicism with traditional native religious practices passed down for hundreds of years. Most Huichol retain the traditional beliefs and are resistant to change. Their religion consists of four principal deities: the trinity of Corn, Blue Deer and Peyote, and the Eagle, all descended from their Sun God. These rituals involve the hallucinogenic cactus known as peyote, as well as singing, weeping, and contact with ancestor spirits. Their primary languages are Huichol and Spanish, and there are translations both of the Bible and the Jesus film in the Huichol language. 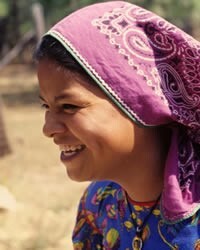 Pray for God to raise up workers for the Harvest among the Huichol. Pray for God to create a hunger in the heart of the Huichol to know Jesus as their one true Lord and Savior. Pray for the barriers of traditional Huichol Aztec religious practices to be broken down so that they can hear and understand the truth of the gospel.